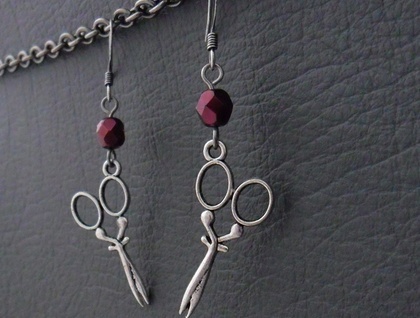 Antiqued-silver coloured scissor charms dangle below beads of pearlescent Czech glass in a rich garnet red. 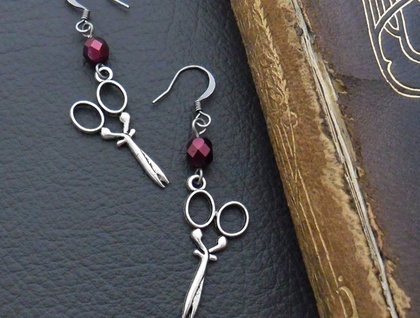 The ear hooks are made of brass, plated with silver, then antiqued (artificially aged) for a vintage look. Czech glass is famous worldwide for its high quality. These Czech glass beads have been given a pearlescent coating so that they gleam, rather than sparkle or shimmer. These vintage-inspired earrings would make a quirky gift for a crafter, dressmaker, or anyone who has spiffing skills with fabric! 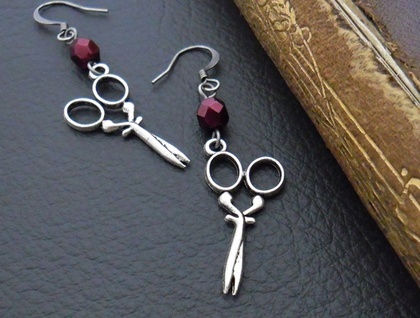 The 'Artful Seamstress' earrings measure 56mm from top to bottom. 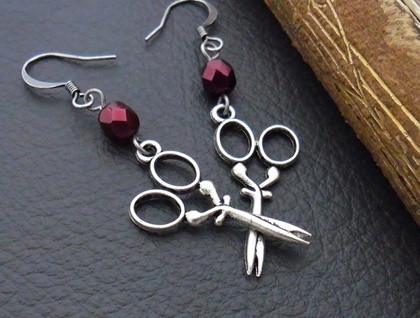 The scissor charms are 29mm long, including the baile (the hanging loop at the top), and 13mm across at the widest point of the handles. For shipping and returns policies, and other information, please see the 'about this maker' link on the left.